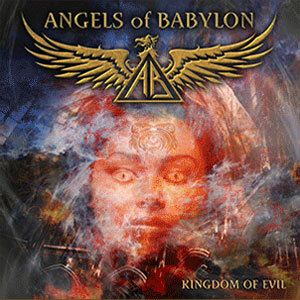 Angels Of Babylon are a new band consisting of drummer Rhino (ex Manowar), bassist Dave Ellefson (ex Megadeth), vocalist David Fefolt (who sang on the Masi album Downtown Dreamers back in the late 80’s) and guitarist Ethan Brosh (who released an instrumental offering last year). A promising line-up in terms of personnel who have come up with 10 tracks on their debut “Kingdom Of Evil”. Unfortunately the album never really gets out of mediocre in the song department with a collection of classic metal inspired tracks that don’t really say anything to me. The performances are generally good throughout, although Fefolt’s vocals are gruffer than I remember and do grate a little after a while. Brosh delivers some good lead work but never does it show anything other than competence with little personality. Rhino and Ellefson do little more than keep things solid and there is an overall lack of flair in the material here making this heavy going for the most part with only the middle trio of heavy metal ballad of “Tear Out My Heart”, the driving “Oh How The Mighty Have Fallen” and the grooving “Tarot” pulling themselves out of the department marked mediocre. Whether there is enough quality here to sustain a career is in serious question, on paper everything looks good but this debut is filled with too many plodders, one dimensional performances and an overall lack of excitement – not helped by a dark production which does little to add excitement to the proceedings. Be sure to check out some clips on the bands myspace before shelling out your pennies. This entry was posted in Reviews and tagged Angels Of Babylon, Babylon, Dave Ellefson, Dave Mustaine, Heavy metal music, Manowar, Megadeth, Metal Heaven, Singing. Bookmark the permalink.